for one of my Gentle Readers! What better way for a "widder lady" to celebrate this day than by giving a wee giftie to one of you? And the winner of this Valentine's Day Surprise drawing is... Peggy! I'll be in touch shortly to get your snail mail address and send this off to you. 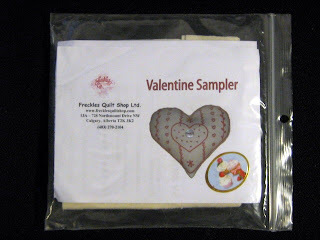 Happy Valentine's Day to all -- and happy stitching! Lovely little kit, Happy Valentines day.